On March 5th, 2015, The 7th Annual Asian Pacific American (APA) City Advocacy Day kicked off in the front yard of the city council despite the worst catastrophic weather with an enthusiast crowd of various ethnicity based organization and their core supporters. 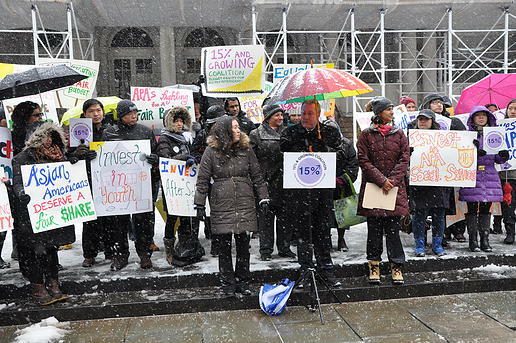 The 15% & Growing Coalition co-led by the Coalition for Asian American Children and Families and the Minkwon Center of Community Action, unite over 45 plus Asian led or serving organizations in the greater New York City. City Council Member Daniel Dromm (D-Queens) was one and only council member in the press conference and as always he assured to the participants and their respected organizations his continued effort and support to distribute a fair share of the city’s discretionary budget. Sheelah Feinberg Executive Director of the Coalition for Asian American Children and Families emphasized the need for adequate financial resources and services to meet the challenge of the fast growing Asian Pacific American population. Helen Kim, Executive Director of the YWCA and Khema Wright, Community Organizer of the MeKong were the other speakers of the event. 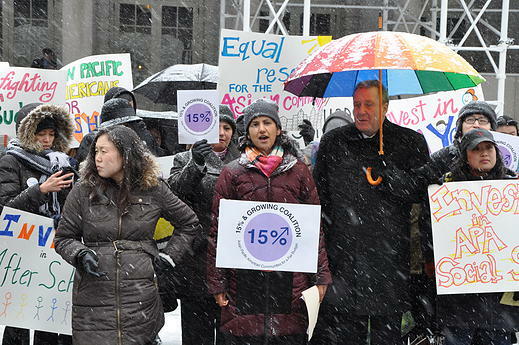 Asian-led organizations have not received the proportionate fund and a fair share in the city council annual budget. This year they have barely received 2.9 percent of discretionary funding of $54.6 million discretionary dollars, which was 2.7 percent in the fiscal year of 2014. Despite the rainy worst weather 45 Asian led and serving organizations showed their collective voice and strength in the city advocacy day. The expanded coalition aiming for the state and city government to have fair budgets that safe guard the most vulnerable Asian Pacific American New Yorkers. Asian Pacific American population is rapidly growing in the New York City but they are lacking far behind to secure their proportionate fair share, political and legislative power. This diverse population in the New York City includes people from over 23 ethnic groups who speaks more than 40 languages and dialects. 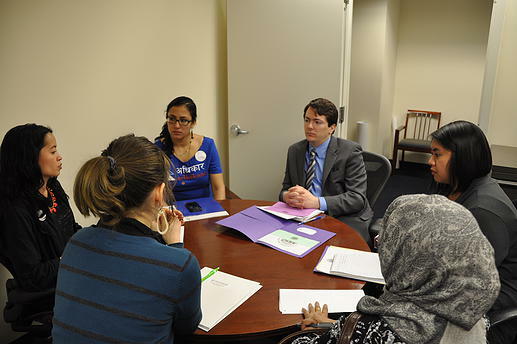 After the press conference the various participant organizations made a scheduled visits with more than 21 Council Members and their staffs to discuss and convince the mission of advocacy day. And they strongly demanded to increase the discretionary budget in the fiscal year 2016.